Elusive New York artist Richard Hambleton will be the subject of an exhibition at The Dairy in London, following highly successful exhibitions in New York, Milan, and Cannes. The exhibition, opens on 18 November 2010 and has been curated by Vladimir Restoin Roitfeld and Andy Valmorbida in collaboration with Giorgio Armani. Having virtually disappeared from public view for 20 years, Hambleton returned with a hugely successful New York show last year which has sparked a massive resurgence of interest in his career and work. A recent exhibit in Moscow has been recorded as one of the most visited art exhibitions in the city ever. For the London exhibition 45 pieces will be on display at The Dairy, 25 of which are never before seen works. The show will also include eight custom made light-boxes with photography of Richard Hambleton’s original street art from the early 80’s. Richard Hambleton rose to fame in the early 1980’s when like his contemporaries, Jean-Michel Basquiat and Keith Haring, he used the streets of New York, San Francisco, Berlin, Paris, London and Japan as his canvas for visually arresting public art, most notably his “Shadowman” and “Crime Scene” series. Hambleton has now been labelled ‘The Godfather of Street Art’, influencing artists such as Paris based street artist Blek le Rat and English street artist Banksy. 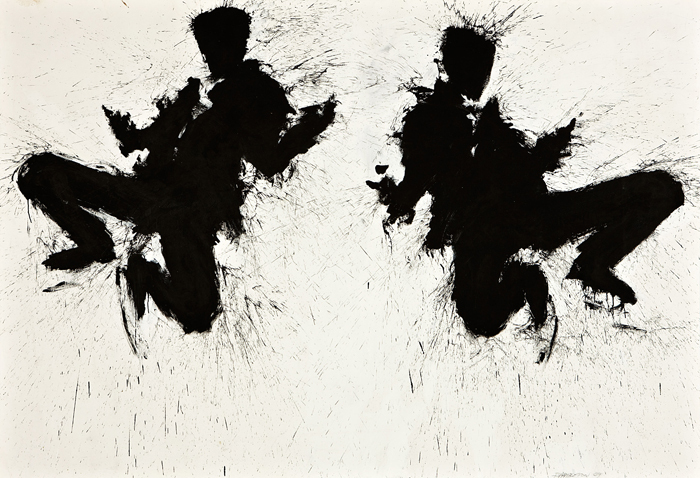 The Richard Hambleton Exhibition will be open to the public from 19 November to the 3 December. During that time the pop-up gallery at the Dairy, will be open Monday to Friday from 10am to 7pm. Definitely looking to check this exhibition out! I am really excited to see this exhibition - this guy was so influential to a whole generation of street artists, and it is great to see him reappearing! Yesterday, my name wasn't on the list of cool people and I couldn't see it. Isaac, the show runs for a few more days go have a look if you are in London.